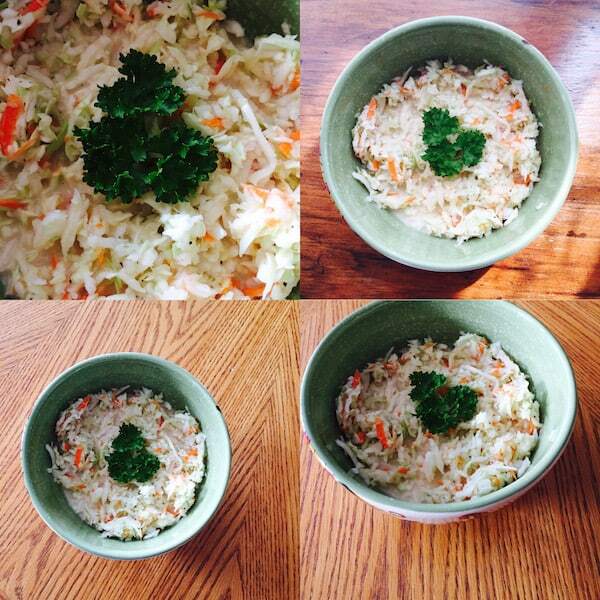 My mom made amazing Coleslaw. Her’s tasted exactly like Kentucky Fried Chicken’s recipe. Although mine is good (Don loves it), it is not the same as Mom’s. I think one of the reasons is that my mom ground her cabbage and I generally shred mine. But I like it both ways. The favor is great and Coleslaw is easy to make. 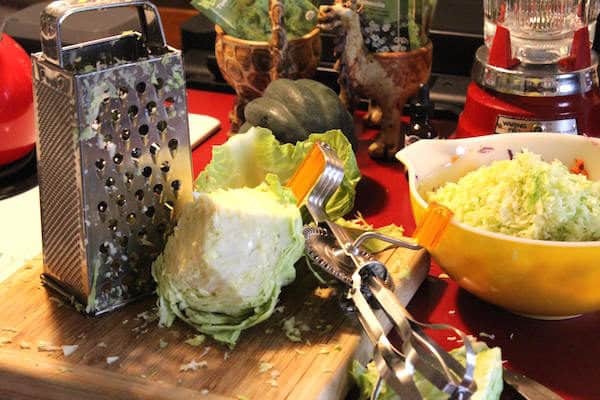 You can use a hand grater or a food processor to grate your cabbage for Coleslaw. Photo courtesy of Kathleen Stinehart. One word of caution, however. This recipe is made with Miracle Whip (you can substitute Mayonnaise and a little lemon), so you can leave it sit out at a picnic for no longer than an hour. If it’s going to be HOT the day of your picnic, it’s best to use a vinegar-based dressing. Food for summer. Try it on barbecue. You can use purple cabbage in this recipe, too. It’s pretty both ways. 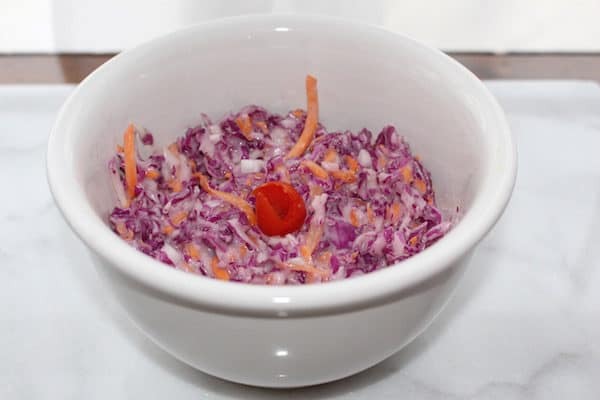 Coleslaw made with purple cabbage. Do you know that in the South (North Carolina, specifically) pulled pork sandwiches (often called BBQ or barbeque) are served with Coleslaw on top of the meat (in the sandwich!). 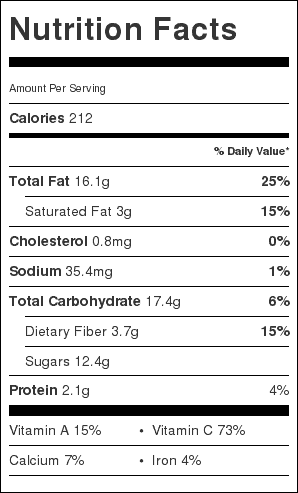 I found that shocking when I moved to Virginia, but it is delicious! Try it. You’ll like it. 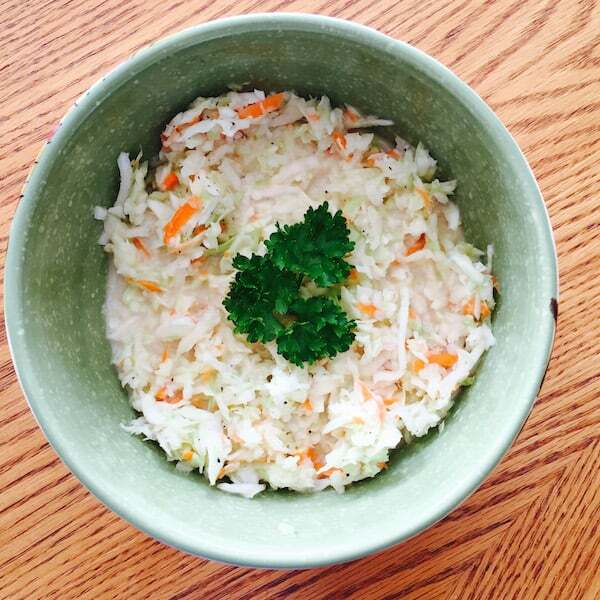 Mix the cabbage, onion and carrots. Separately in a small bowl whisk the salad dressing, milk, sugar and a little salt and pepper until smooth. Pour the dressing over the cabbage combination. Mix until the salad is evenly coated with the dressing. I love cole slaw! This version sounds delicious. Lois makes the best coleslaw! By the way, do you hate it when we tinker with your ingredients? Because instead of Miracle Whip and white sugar, I used Vegenaise and maple sugar because that’s what I had on hand. Recipe still worked, though! Great! We LOVE it when you tinker. That’s why we call our site Recipe IDEA Shop!